Twitter is a funny, messy place where topics and tropes wantonly mingle and merge. Memes about Tide pods follow presidential proclamations. Rankings of Very Good Dogs scroll alongside obituaries. And sometimes you can go to Twitter for updates on twenty-first-century American politics and find modern-day illustrations of your-seventeenth-century English research interests. Or at least I did when following a tweet thread from Benjamin Wittes (Senior Fellow in Governance Studies at The Brookings Institution and editor-in-chief of the acclaimed Lawfare blog): between intergovernmental document requests, I found the kind of cultural exchange of recipes that fascinates me. In the Lawfare blog post, Wittes explains he had heard rumors that a 2017 holiday message from CIA director Mike Pompeo was divisive, “inappropriately political and exclusionary.” He filed a Freedom of Information Act (FOIA) request to see the message and wrote a post about it (as he does with all FOIA requests he makes). We both agree that our country is facing some of the most complex national security challenges in history and that we all benefit if we work jointly to promote American national security, even if we disagree on the best way forward. It is unfortunate, indeed sad, that you chose to publicly cast doubt on our team without so much as the courtesy of a simple phone call that could well have answered your ‘question.’ You should have been better than that, Ben. I hope, too, that you will try the fudge recipe that I also included in the workforce message. It is my mother’s recipe and she loved that others enjoyed it during the holiday season. As you can see in the document embedded in the post, the recipe itself is a little ho-hum (apologies to Dorothy Pompeo)—it is almost identical recipe to one found on the back of jars of marshmallow fluff. This is not to say, however, that the recipe is presented as generic—it is printed on holiday paper, highlights pictures of the Pompeo family (including the dog) attempting the recipe, and adds a little history of Pompeo’s mother, Dorothy. Despite its lackluster provenance, the recipe’s title trumpets this recipe as “secret,” a now clichéd way of lending a recipe authenticity and value. The recipe is framed as not just a postscript, but a valuable gift. Many scholars, notably Amanda Herbert, have pointed out the use of recipes to create alliances and cement bonds of friendship. Herbert discusses women’s social networks in the seventeenth-century, but similar kinds of dynamics seem to be at play in this exchange between twenty-first-century men: the written recipe as means of cultural exchange and the reliance on ethos of the recipe’s author (Mike’s mother, presumably invoking tradition and welcome). Is this recipe for fudge, then, a gift, an olive branch of sorts from Pompeo to Wittes? An attempt to create an alliance across political difference in a fractured and contentious American moment? Or is this gift of a mother’s fudge recipe a performance, a sort of folksy, downhome counterstrike meant to evoke human exchange over legal maneuvering? As to Pompeo’s accusation about me, I post all of my FOIA requests and will continue to do so. I will also always post all responses I get to them—whether they support, or, as in this case, refute the premises that led me to submit them. I look forward to trying his mother’s fudge recipe. Before he could get around to it, however, an associate of his, Shannon Togawa Mercer, managing editor of Lawfare blog, tried the recipe with happy results. This window into government and intelligence-communities also shows that recipes retain enormous cultural capital and can both convey meaning and actively form bonds. They say politics makes strange bedfellows. Apparently, politics also makes strange kitchen-mates. In a world view that relied on correspondences between macrocosm and microcosm, and in a humoral medical system that utilized similarities between bodily functions and features of the natural world, one can imagine no more fitting emblem than the cold, mucousy snail. This slimy and gooey creature would seem the perfect treatment for an excess (or lack) of slimy, gooey phlegm. 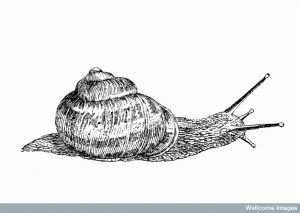 Many household recipe books had recipes for snail water. 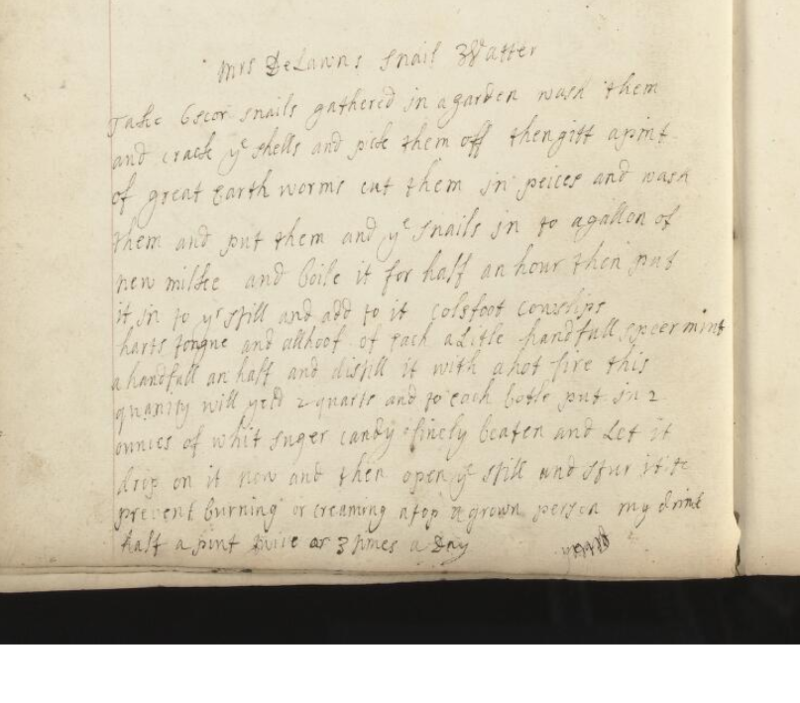 These recipes generally called for shelling the snails and cleaning and boiling them in a mixture of milk and white wine or ale. 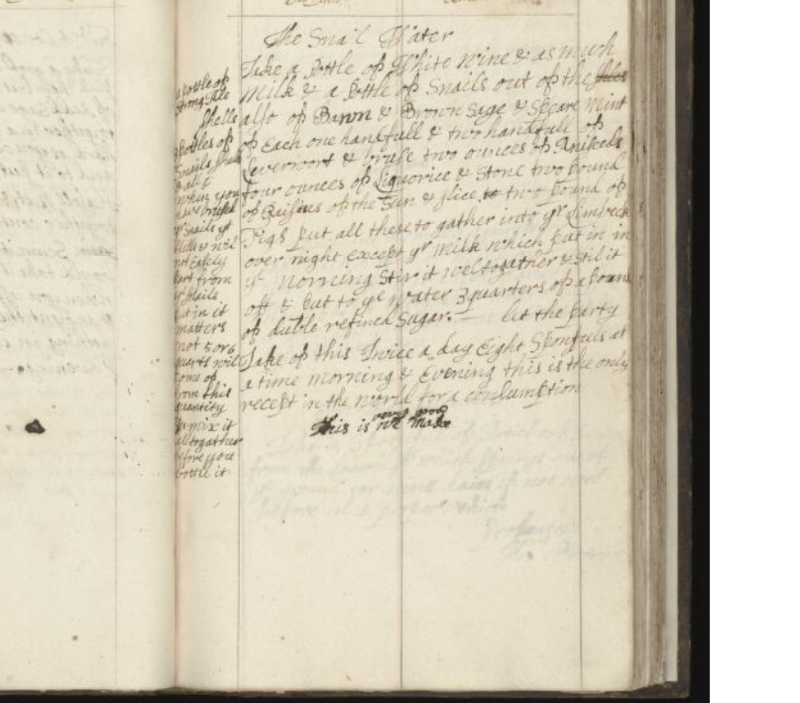 This recipe from Mrs. Elizabeth Hirst’s recipe book (early 18th century with some contemporary additions) is fairly typical, though it includes and additional ingredient: slimy, gooey earthworms. Take 6 scor snails gathered in a garden wash them and crack ye shells and pick them off then gitt a pint of great earthworms cut them in pieces and wash them and put them and ye snails in to a gallon of new milk and boile it for half an hour then put in in yr still and add to it coltsfoot cowslips harts tongue and alehoof of each a little handful spearmint a handful an half and distill it with a hot fire this quantity will yeld 2 quarts and to each bottle put in 2 ounces of whit suger candy finely beaten and let it drop on it now and then open ye stile and stir it to prevent burning or creaming atop a grown person may drinck half a pint twice or 3 times a day. One could argue, in fact, that vestiges of humoral thinking remain to this day, particularly in the beauty industry. In the last couple of years, snail mucus has been marketed as a wonder treatment for wrinkles, acne, and skin texture. For example, through a company called Holy Snails, you can buy a hydrating serum that contains snail mucen extract. And even the big-box store Target has joined the trend, offering the “Super Aqua Cell Renew Snail Skin Treatment” containing 30% snail slime extract. If you’d rather have a more direct route from snail to skin, you can also opt for treatments in which technician prod specially raised, organically fed snails to ooze all over your face. Regardless of efficacy, however, one can see in these skin lotions and spa treatments some vestiges of early thinking about correspondences and humoral theory–and of the very human urge to look to nature for answers, signs, and cures. This poem was a central focus of a structured conversation program I attended about power and place, specifically about diversity and assimilation. Participants in the conversation wondered how they could replicate that kind of scene in their own lives and workplaces, what they could offer that would bring people together in a similar way. As shorthand for this complicated question, people asked, “What is the ‘cookie’?”–i.e., what commonality could bring people from disparate backgrounds and ideologies together in community? I’m a firm believer that foodstuffs and recipes bring us together in a singular way, providing a means of exploring the stories that make us who we are while connecting us to a larger community. 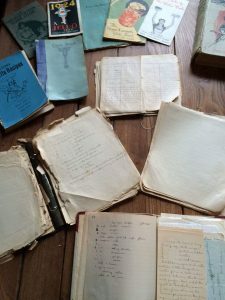 Recipes are freighted with meaning, bearing stories and emotions, memories and hopes, community and connection. And that’s why when our statewide humanities program, Oregon Humanities (an affiliate of the National Endowment for the Humanities) put out a call for topics for a “Conversation Project” program, I immediately thought of recipes and their power to help us connect and commune. Sometimes the most overlooked objects can offer the most perceptive insights about ourselves and others. 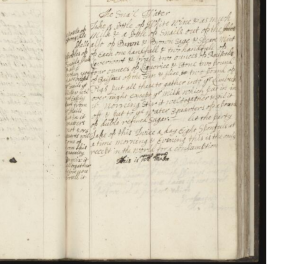 In this conversation, writer and independent scholar Jennifer Roberts introduces historical and current recipes and asks, How do recipes work? Why do we collect them? Who do we write them for? By sharing our own assumptions and memories, we will examine how recipes can help us connect and create communities across time, distance, and culture. For this program, I invite participants to bring treasured recipes to share with others (and I in turn share my Grandma Sherman’s recipe for toffee, which calls for, in part, “5 cents worth of Woolworth’s chocolate” and instructions that, in lieu of butter, “the hoi polloi may substitute 1/2 cup margarine”). To date, I’ve conducted three conversation projects, all with a similar structure. We open by talking a bit about ideas people associate with recipes. Almost always words like “family,” “nourish,” and “tradition” come up. Then we talk about what makes a recipe a recipe (as opposed to, say, a grocery list or a poem) and quite often people talk about things like measurements, math, and instructions. We discuss the gap between these two ways of thinking about recipes: the evocative, emotional words used to describe recipes and the precise, scientific ways they are presented. After a short discussion, I show the group some examples of historical medical recipes from the Wellcome’s extensive collection and we talk about how “receipts” have changed over time. We read the story Stone Soup together and analyze its themes of community, sharing, and belonging. After some more discussion, I show the group examples of recipe collections that have served or reflected their communities: Freda DeKnight’s A Date With A Dish; a collection of recipes from the women of the German concentration camp Terezín; and the medical recipes of Ing (Doc) Hay, who emigrated from China to John Day, Oregon in 1887 and became a popular medical practitioner for many decades (there is an excellent documentary here). But while I enjoy sharing these examples, I am far more eager to get the participants talking to each other and sharing their own recipes and histories. In fact, I’m a bit greedy for them, as my long-term plan is to collect enough recipes and stories to offer a free, statewide recipe collection. The editors of The Recipes Project have kindly agreed to let [editorial correction: were wildly enthusiastic to have] me share some of the insights and stories that arise from this conversation project in future posts. I look forward to reporting back on the results of this exciting project in the coming year! A Stitch in Thyme? : Why Are There So Few Knitting Patterns in Recipe Books? When I first began researching early modern recipe books, I was struck by how they upended my expectations of the genre. 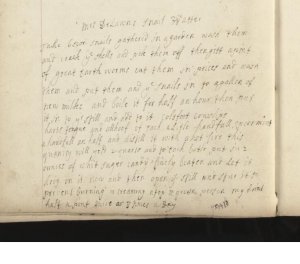 Some of the recipes seemed to me, quite frankly, weird: the making of puppy water, the application of dung to a wound, the addition of ground human skull to a medicine. And it became clear that they comprised all manner of early modern daily life, not just food. I was struck by how the recipes jostled together on the page, often with little overt organization. In thinking about the genre, it struck me that this kind of writing is relatively unique to the domestic sphere. Recipe books look nothing like court documents or epic poetry, sermons or stage plays. They do, however, resemble another kind of domestic writing: knitting patterns. Since early modern recipe books contained instruction for making food and medicine and cosmetics, why not instructions for making clothing? From my experience with modern recipes and knitting patterns, it seems like a perfect fit: like recipes that specify ingredients and quantities in cups and teaspoons, modern knitting patterns indicate necessary materials in fiber content, exact yardage, and the diameter and length of needles. As with a recipe, this quantification is followed by instructions for converting the raw material to the finished product. The writing is plain and seldom figurative. Indeed, one could call a knitting pattern a “recipe” for clothing. 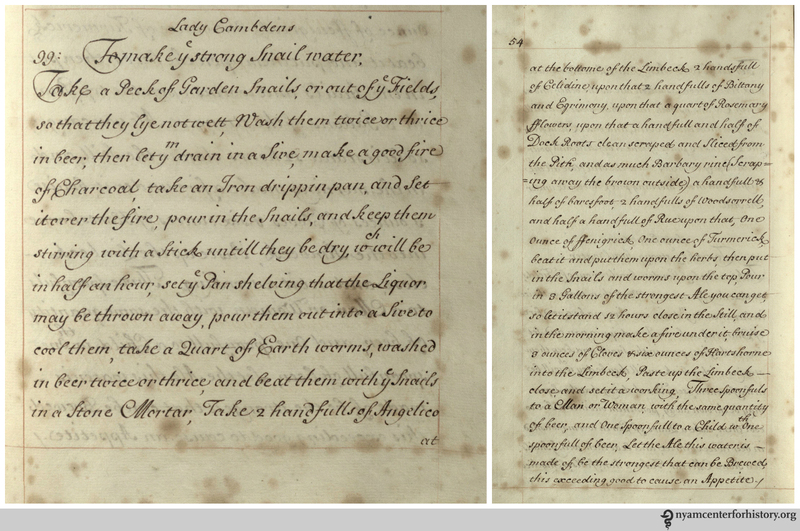 Knitting patterns, however, are singularly absent from recipe books of the early modern period. There is, however, a telling exception. 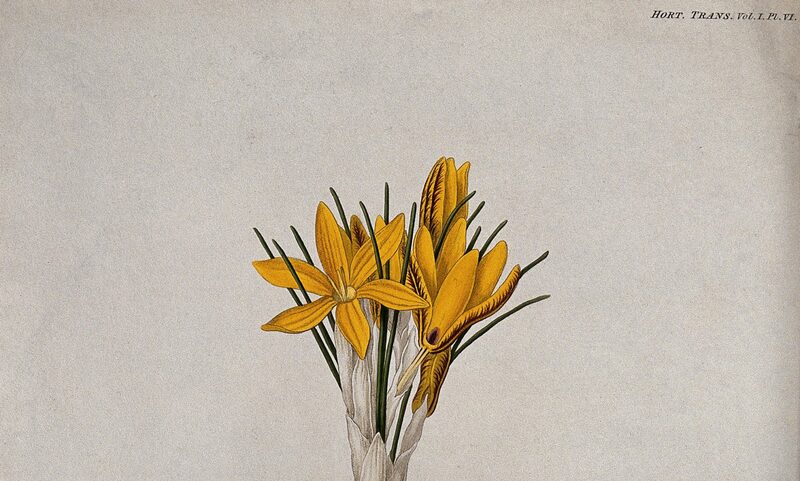 Sue Davies has pointed out that the 1655 medical compendium Natura Exenterata: or Nature Unbowelled by the Most Exquiste Anatomizers of Her, contains several pattern at the end of the work. In the Natura Exenterata, the patterns, like recipes, are laid out one per entry to favor ease of location and organization. And like recipes, the instructions are written in a straightforward, matter-of fact tone, with very little editorializing or figurative language. To make Network like seven Eyes. The first course, wind your thread about your pinne at every stitch, and the second course take two long stitches upon your needle and turne the second stitch into the first long stitch inward to your hand and pull it through your first stitch, and the thread of your first stitch, turn it inward through the second stitch down to your pinne like a loop or a Nouse, so that the thread of the loop must lye upon the nouse upper∣most, then work your nouse down to your pin, and the next stitch or thread that lyeth upon your nouse work down to your pinne, and make a stich. 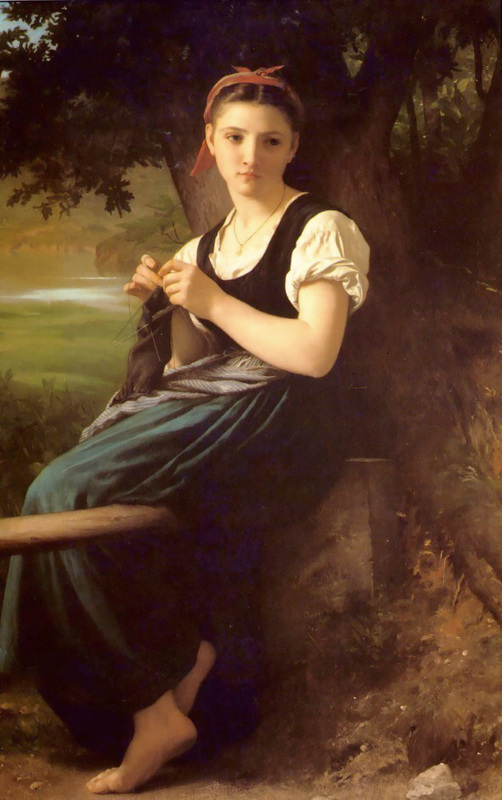 Provided alwayes if your work go true you have two knots toge∣ther, and a wide bout between, and the next third course begin your work again and round your thread about your pinne at every stitch, as you did before at the beginning of your work. It’s telling, however, that with the knitting patterns in this compendium there is no indication of the quantity or type of materials needed. The knitting pattern is composed exclusively of instructions, unlike a contemporary pattern. excellent resource for such a question is the digitized Knitting Reference Library at the University of Southampton. In that database, we can see some movement towards quantification happening in the mid-19th century. 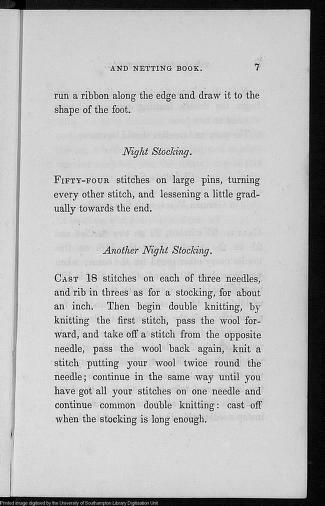 In The Ladies Knitting and Netting Book of 1838, for example, there is only occasionally mention of the type of yarn (“German Wool”) and no note of the size of needles required. By 1874, however, we can see in The Lady’s Knitting Book that “pin” (needle) sizes and type of yarn are frequently listed. I wonder if the shift into recording the exact quantities of materials–together with the addition of pictures of the final product (as seen here)– reflects a contemporary insistence on mass reproducibility. There is an implied guarantee that, if the identical brand of yarn, the exact fiber content, and precisely the same size needles are used, the final product will be an exact replica of the (perfectly lit, professionally photographed) final object. I wonder, too, about the future of these genres, recipes and knitting patterns. Crafting books and cookbooks are now often published under “celebrity” names. There are famous knitters like Kaffe Fasset, Debbie Bliss, and even Vanna White (of “Wheel of Fortune” fame). Issuing cookbooks are any number of cooking channel celebs, from Padma Lakshmi to Emeril Lagasse to Nigella Lawson. And both genres are being revolutionized by the digital world: whether one needs a recipe for crepes or cardigans, one need only consult Google.